Don't let the flavor fool you. I was so excited to buy a new small lotion for my purse. As I am sure most of us do, I smelled all the flavors. I decided on buttercream cupcake. Does it get any better than that. Well, actually it does if the cupcake is chocolate with butterceam icing. I put the lotion in my purse and then forgot about it. Later that week, we went to the movies. On the way I remebered my new lotion. In the dark of the car, i squirted out some lotion. It smelled unbelievable. I rubbed it all over my hands. It seemed a little thick and felt a little waxy on my hands. I had never tried this brand before, but by the time the movie started, it had all soaked in and my hands seemed really soft. Several days later, while at church, I decided that I needed some more lotion. I pulled the bottle out of my purse, squirted some in my hand, and for the first time, had my glasses on and read the label on the bottle. 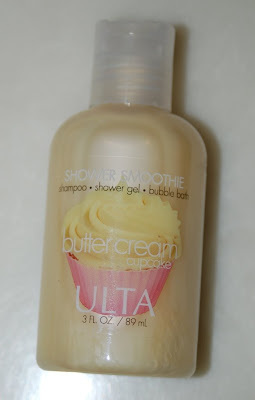 My lotion turned out to be shampoo, shower gel and let's not forget bubble bath. 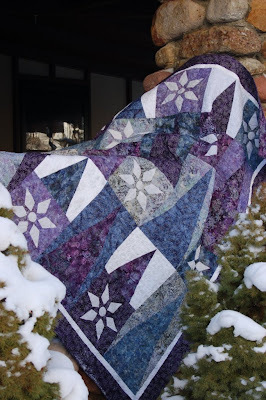 I ventured out yesterday, braving the elements of course, 29 degrees and 2 1/2 feet of powdery snow to get the perfect lifestyle shot of one of our new quilts. It is called WINTER WONDERLAND, hence the treck through the snow. I drove up Ogden Canyon, a beatiful place on it's own. 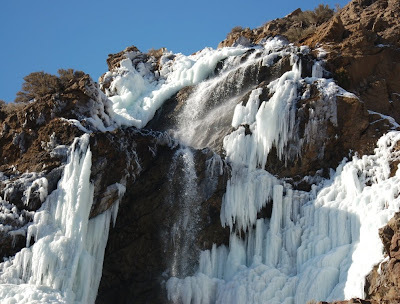 Along the way, I had to stop and take a couple of pictures of the waterfall on the side of the mountain. Pictures just don't do it justice. 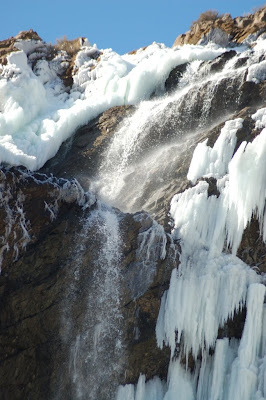 The water falls nearly 200 feet and leaves the most beautiful ice patterns in its' wake. It is breathtaking from the road which probably explains the wreck that happened about 100 feet after the waterfall. I was parked on the side of the road at the time. I did get the shot I was looking for for the pattern cover. What do ya'll think. We have more projects going on that even we can keep track of. For those who have been asking, we should have patterns written and ready to sell for both WINTER WONDERLAND and SEPTEMBER MORN the first part of February. We will keep you updated. Have a great weekend and stay warm. p.s. Marcea is the dingy one who softens her hands with shampoo. Haha! Nice one with the shampoo-lotion. You girls and your never-there-when-you-need-them glasses:). Amazing pics and beautiful quilt! ROFL over the lotion aka shampoo!! While my friend Lynn was here the other day, she used my bathroom to fix her contacts. Since the door was open, I stood in the doorway and yakked at her. She'd already pumped 2 or 3 times on the bottle on the counter before I realized what she was doing. Yep-shampoo not lotion. She couldn't use the no glasses excuse though!! THE WINTER BLUES AND FALL LEAVES ARE HERE!